Dr. Odugbesan received his Medical degree from the University of Lagos, Nigeria. He completed his Internal Medicine residency in Scotland, followed by a Diabetes Research fellowship at the University of Birmingham, England, UK.. After moving to the United States he completed his fellowship in Endocrinology and Diabetes at Emory University. 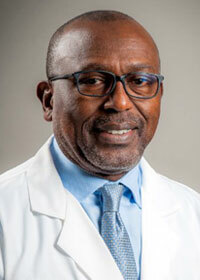 Dr. Odugbesan is board certified in Endocrinology, Diabetes, and Metabolism. He is a Fellow of the American College of Endocrinology and a Member of the Royal College of Physicians of London. He maintains membership in the American Association of Clinical Endocrinologists, the American Diabetes Association, and The Endocrine Society. Dr. Odugbesan has extensive research experience in diabetes and thyroid disease.